Statistics suggest that by 2035, India alone will be a home for approximately 110 million individuals suffering from diabetes. Diabetic patients have to get Insulin administered either subcutaneously or intravenously, as some biologic drugs like insulin cannot be formulated in a capsule form, as it disintegrates rapidly in the stomach or gastrointestinal tract and is poorly absorbed. 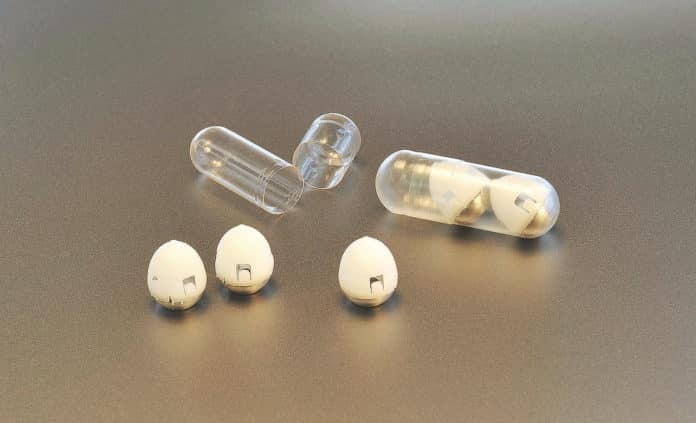 Novel insulin containing oral capsule has been formulated by scientists at Brigham & Women’s Hospital, the Massachusetts Institute of Technology – MIT & Novo Nordisk. This pea-sized pill shell, inspired by the shape of leopard tortoise shell – functions by injecting insulin directly into the stomach lining upon reaching the stomach. Since the ingestible microneedle is self-orienting, the capsule does not degrade in the stomach environment and injects the insulin directly into the stomach lining. As per result obtained from tests on pigs, the self-orienting millimeter scale applicator (SOMA) delivers insulin directly into the bloodstream with no side effects associated. SOMA can be used to deliver other drugs & large molecules such as peptides, proteins, nucleic acid etc as well, thus can play an important role in future drug discovery & drug delivery research & development. As per Giovanni Traverso, MB, Ph.D., an assistant professor at Brigham and Women’s Hospital who was a part of the research team with Robert Langer and scientists from Novo Nordisk – The capsule travels down to the esophagus in seconds, in a few minutes it’s in the stomach and then the drug is released. The team previously had also developed a pill coated with numerous tiny needles that could inject a drug into the lining of the stomach or small intestine. The SOMA capsule comprises a single needle, with the shaft being biodegradable and its tips made of compressed freeze-dried insulin. The needle is based to a spring held in place by sugar discs within the capsule. Upon reaching the stomach lining the discs dissolve triggering the microinjection. Since the stomach walls are devoid of any pain receptors the pate its will not feel any pain during the process. The main point to be noticed here is that this capsule will work only on an empty stomach, with nothing in it’s way to get discoursed. Thus it might replace the morning insulin shots but not the one’s take post meals. The teams at MIT & Novo Nordisk are currently working to further optimize the technology and its manufacturing process. Additional animal studies are underway, and if all goes well human testing can begin within three years.